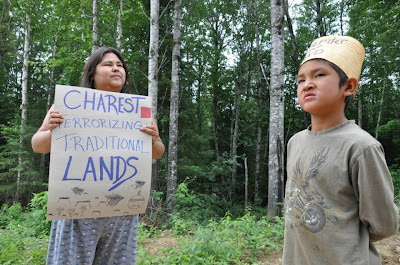 A group of Barriere Lake Algonquins have been camped out at Poigan Lake, Quebec for almost a week now, determined not to leave the site until Resolute Forest Products (formerly AbitibiBowater) agrees to stop clear-cut logging their unceded territory and engage in a meaningful consultation process with the community. See below and added posts at www.ipsmo.org for ongoing coverage of the situation. The community is now asking for crucial outside support in order to increase pressure on the government and forestry companies to meet the demands of the traditional land-holders. Please take a few minutes to support their struggle to protect their lands and identity by sending a letter to the Minister, attending a casserole action in Montreal, or donating money for supplies. Take 3 minutes to click this link http://www.barrierelakesolidarity.org/2007/10/blog-post.html and send a letter to Resolute Forest Products, the Quebec Ministry of Natural Resources, and the Forest Stewardship Council of Canada (of which Resolute is a member). Last week, Resolute Forest Products (formerly known as Abitibi-Bowater) began active clear-cut logging on the traditional territory of the Algonquins of Barriere Lake, five hours north of Montreal, on land that is crucial for their culture and survival as a people. The logging company and government have ignored repeated demands by the community for consultation, despite resource-sharing agreements signed by both the provincial and federal governments that require this kind of community participation. Rather than talking with the community, the government sent the riot squad of Sûreté du Québec (SQ) to enforce the continuation of logging, and threatened to arrest the families who are currently camping near the logging site. Montreal-based supporters of the people of Barriere Lake are calling for a lunchtime casserole outside of the logging company offices to demand that they stop their logging and consult with the people of Barriere Lake. After a rally in front of the logging company office, we will continue towards the office of Premier Charest, to protest the criminalization of popular struggle by the government of Quebec. Casseroles began in Montreal as a rejection of attempts by the government to criminalize the popular movement of the students through Law 78 and police repression. For indigenous communities such as Barriere Lake, the struggle against the criminalization and repression of their communities has been ongoing for generations as they struggle to defend their land. No to the criminalization of popular struggle! Solidarity with indigenous defence of the land! Solidarity with the Algonquins of Barriere Lake! Please give generously through our PayPal account: http://www.barrierelakesolidarity.org/2008/03/donations.html (Scroll down for PayPal button). All funds will go directly, with no administration costs, towards supporting the community's efforts. If you have food to donate in either the Ottawa or Montreal areas, please contact barrierelakesolidaritytoronto@gmail.com for more information. Check out www.ipsmo.org for the most frequent ongoing coverage of the land defense camp. Please share within your networks. Better yet, write or pitch a story for your local newspaper or radio station. The sign-up box is in the right column of this website. For an excellent, 4 minute video introduction, click here. For more resources, check out the 'Background' section of this website.